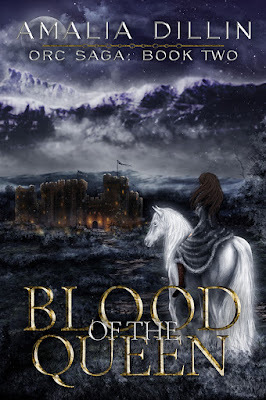 Good To Begin Well, Better To End Well: Release Day for BLOOD OF THE QUEEN! Interrupting your non-stop #NAMEthatBUTT adventures for a brief announcement: YESTERDAY was release day for Blood of the Queen, book two in the Orc Saga! To celebrate, HONOR AMONG ORCS is *Free! * for a very limited time! So if you've hesitated to jump into the adventures of Arianna and Bolthorn -- now's your chance to get two books for the price of one! But there is power at work in Gautar that even the Ancestors fear. Power and magic that a princess and an orc cannot hope to conquer alone. Hiding their expedition from human eyes would be difficult enough, but the growing dangers they face across the mountain threaten to destroy not just the human kingdoms, but the safety and freedom of the orcs, as well. And of course you can learn more by clicking on the Orc Saga tab above, too! ALSO, if you're a fan of the series, or Fate of the Gods, or even HELEN OF SPARTA, I'll be at WORLD FANTASY CON this year in Saratoga Springs, NY (Nov. 5-8) and participating in an author event/signing at the bookstore Flights of Fantasy immediately post-con, on Sunday November 8th, at 6pm! I hope I'll see some of you there!